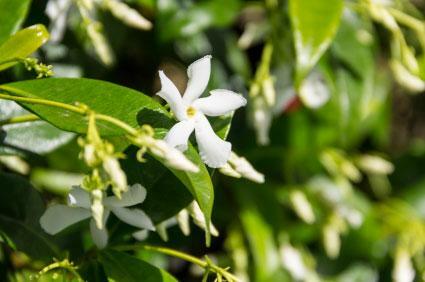 Star jasmine (Trachelospermum jasminoides) is also called Confederate jasmine and trader's compass. It is from Japan, Korea, southern China, and Vietnam. Star jasmine is nicknamed Confederate jasmine for its origins in the Malay Confederacy. It is called traders compass because of an Uzbekistan saying that star jasmine will lead traders in the right direction if they are of good character. Star jasmine is in the Apocynaceae (dogbane) family. Star jasmine is an evergreen vine that can grow to be 20 feet high if supported by a trellis. It has dark green leaves and beautiful star shaped white flowers. 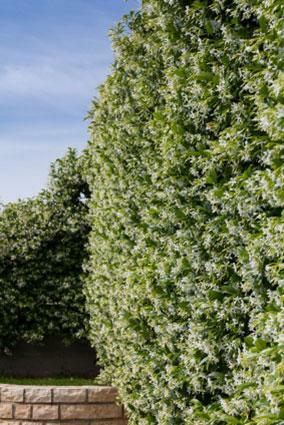 Star jasmine has gained the Royal Horticulture Society's Award of Garden Merit. Star jasmine is used as an ornamental plant in gardens and containers. It is used as a vine and as a ground cover. In Asia, the flowers are used to distil a valuable oil or tincture that is used as a base for many fragrances. In a more dilute form, the tincture is the base for many Asian incenses. Star jasmine is attractive to birds and bees. All parts of the plant are not poisonous. It is safe for dogs and cats. Star jasmine grows in zones 8-10, mostly in the southern United States. It will grow in anything from sun to partial shade, making it valuable as a ground cover in shade gardens. It grows better in partial shade than in the sun, where it is subject to winter kill. Star jasmine requires a structure to climb to produce a vine. This can be a trellis or another plant. Star jasmine blooms in mid-spring through summer. This plant requires well-drained soil. To achieve this, till the soil to a depth of six inches. Add three inches of compost and till it in. The compost will break up the soil and ensure proper drainage. Star jasmine is planted from containers. Space the plants five feet apart as a ground cover. Plants may be planted next to a trellis and trained up it for a vine. In either case, dig a small hole and plant the star jasmine to the same depth it was in the container. Water in. Star jasmine should be watered once a week with an inch of water at a time. Star jasmine is drought resistant, but still needs weekly watering. Prune the star jasmine after flowering if it becomes too vigorous and grows someplace it is not wanted. In the spring, fertilize with a balanced fertilizer. Otherwise, no additional maintenance is needed. Star jasmine is vulnerable to scale, which can be controlled with horticultural oils. If scale attacks, it drops honeydew on the vine, which may cause sooty mold. Keeping the plant too moist may lead to rot root, as well. Otherwise, star jasmine is pretty hardy and disease resistant. Rabbits like to graze on this plant. Star jasmine is resistant to deer. These vendors offer star jasmine for sale at least part of the year. Accents for Home and Garden (Pepper's Greenhouse) has been in business since 1985. Peppers's Greenhouse takes not only credit cards but also checks and money orders, making them a good choice for someone who doesn't want to use credit. Jasmine comes in four inch pots for around $5 and all orders are shipped Priority Mail. Almost Eden Plants specializes in unusual, exotic, and beautiful plants. They guarantee their plants will arrive in good condition if the temperature is over 45 degrees F.
Jasmine comes in a 4.5 inch pot for around $10. Lazy S'S Farm & Nursery has been in business 42 years. They grow all their own plants to sell direct to the customer. They ship jasmine in a one quart pot for around $14. Niche Gardens has been in business since 1986. In the fire ant quarantine zone, all plants are treated with Talstar before being shipped. They ship jasmine in a one quart pot for around $10. Star jasmine is a fragrant beauty which can scent an entire garden with one plant. This versatile plant is used as a climbing vine or ground cover and is drought tolerant. For a hardy and fragrant beauty, plant star jasmine in your garden today.